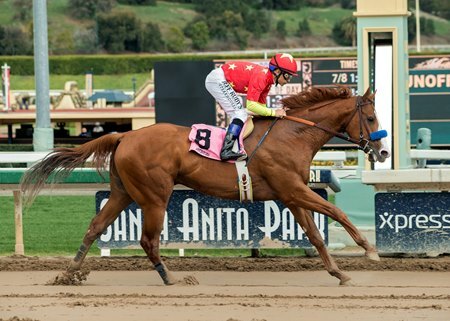 PEDULLA: What kept Justify from running as a 2-year-old? BAFFERT: I don’t know. When I got him, he didn’t have any obvious problems. They just took their time with him. He was a big horse. They just brought him along at his own pace. PEDULLA: Does the fact that he was unraced at 2 bother you? 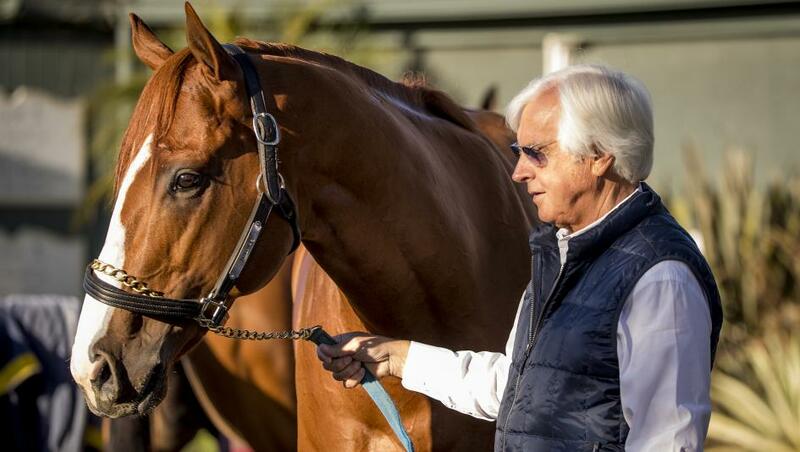 BAFFERT: He probably could have run as a 2-year-old. I think his raw talent makes up for his seasoning. 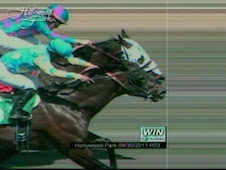 He’s a superior racehorse. PEDULLA: What makes him superior? BAFFERT: He’s probably the most beautiful 3-year-old. When you see him, he’ll catch your eye on the track. He’s just a grand-looking animal. He’s one of the most attractive 3-year-olds you’ll ever see. He’s just a standout conformation wise. PEDULLA: Are you optimistic he will get the mile-and-a-quarter distance? BAFFERT: He’s done everything so quickly. He beat a top contender in Bolt d’Oro in his third out, so I’m not really worried about that. He just needs racing luck. The Derby has most often been won by a horse that came into the race with a career-high Beyer Speed Figure of at least 95. 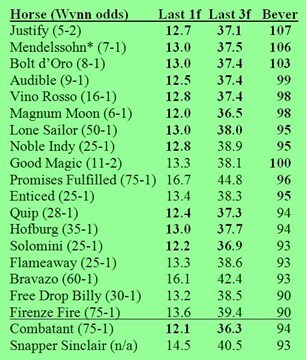 Since Andrew Beyer invented this statistic 26 years ago to create a common denominator among variables like track bias and race-day conditions, 24 Derby winners checked that 95-or-better box before their Run for the Roses. That is 92 percent. They include the four shortest-priced horses in Derby futures at the Wynn Las Vegas – Justify (5-2), Good Magic (11-2), Magnum Moon (6-1) and Mendelssohn (7-1). 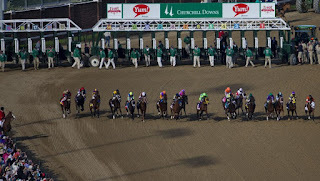 The Derby has most often been won by horses that finished their last 1 1/8-mile prep races with a final furlong of 13 seconds or less and/or a final three furlongs of 38 or less. Combine these two criteria, and the field is narrowed to just eight horses – Justify, Magnum Moon, Mendelssohn, Bolt d’Oro (8-1), Audible (9-1), Vino Rosso (16-1), Noble Indy (25-1) and Lone Sailor (50-1). That leaves Justify, Magnum Moon, Mendelssohn, Bolt d’Oro (8-1), Audible (9-1), Vino Rosso (16-1), Noble Indy (25-1) My Boy Jack (20-1). Since the Kentucky Derby points system was introduced in 2013, no horse has won the race with fewer than 100 qualifying points. Magnum Moon 150, Magic 134 Audible 110 Indy 110 Rosso 107 Bolt 104 Enticed 103 Mendelssohn 100 Justify 100. This year's Derby is loaded with speed which may set up a killer pace, thereby favoring an off the pace winner or deep closer. Horses that fit the bill are My Boy Jack, Hofburg, Combatant, Vino Rosso, and Lone Sailor. 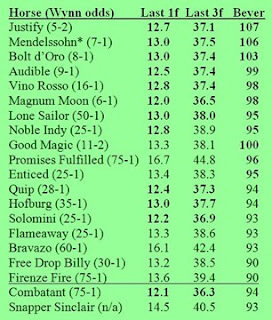 Audible has the co-fastest Thoro-Graph number this year, is improving with every start, and his four triple-digit Brisnet late pace figures, two of them after fast middle pace figures, indicates a horse with a very high cruising speed who can keep up with a fast face and close fast off it. What 3-year-old has run the fastest Thoro-Graph number in America this year? Hint: it’s a tie and they all did it in their final Derby prep. The tie is between Justify, Audible, and Vino Rosso. Will Justify be the sixth favorite in a row to win the Derby? His Thoro-Graph number in the Santa Anita Derby was very strong, as was his Beyer figure, and his 117 late pace figure on Brisnet after running a 106 middle pace figure was spectacular. 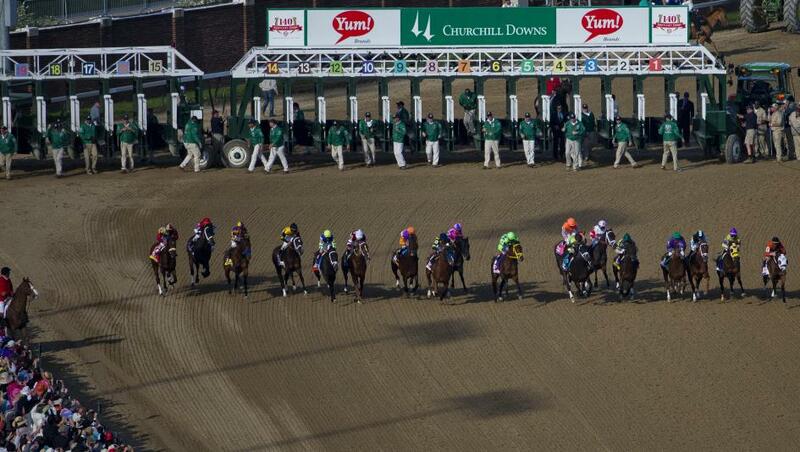 If he closes like that in the Kentucky Derby I doubt anyone can match it. All three of his Brisnet pace figures in the Santa Anita Derby and his final speed rating were in triple digits, with each pace figure faster than the previous one, which is sensational and may indicate we really are dealing with something very special.